Perogies & Gyoza: Duck! Rabbit! This book is by no means deep. There are no philosophical questions to answer here. But it is fantastic. The basic premise is on the cover - what you see is what you get. An optical illusion makes this little dude appear like a different type of animal depending on your point of view. Two viewers try to figure this out, and we the readers get to play along too. My daughter was on the duck side, and my son thought it was a rabbit. It's interesting to note that they each sat on the side that corresponded to the mouth of that animal in my lap. We are big fans of other books that the author and illustrator have produced, like Lichtenheld's Shark vs. Train and Krouse Rosenthal's Plant a Kiss. Their books, no matter who they collaborate with, always have sweetness and humour, and are easy for beginning readers to read. Big winners in the K-2 set! This one was a hit with adults too! I had a few friends (my own age!) 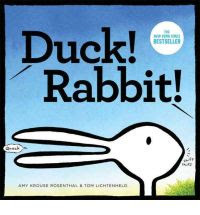 over on Sunday night and when the kids brought this book out they had fun discussing whether this was a Duck or a Rabbit. Considering none of these people are native English speakers, I'd say that's a pretty successful book. I think it would be great for English conversation classes. SO cute. I love the nice dark lines. I love it when adults can enjoy kids books too!